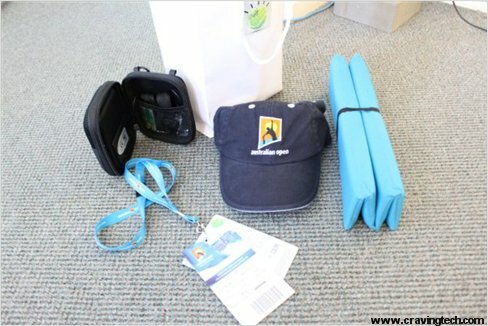 I was sponsored by IBM(a couple of days ago on 25th Jan 2010) for an Australian Open “behind-the-scene tour” and also to watch the tennis live after the sessions. 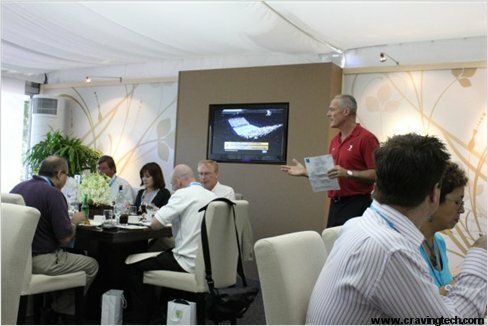 I was actually invited to join a group called the “Insights 10”, a group of 10 technology enthusiasts outside of IBM a few months ago (thanks to this blog) and this was the first event where we had the chance to meet with all members of the group (apart from the other missing 5 members). I’m sure there’ll still be exciting things happening in the future for this group such as webinars, live events, and other collaboration work that we can all do together. How do they keep up with the statistics of the tennis players (unforced errors, forehand winners, etc)? How do they measure the speed of the ball when they serve? How does the challenge replay system work? Hopefully this post may shed some light to you if you are having the same questions about “Tennis’ technology” in general. It was really amazing to actually see the technology “behind the scenes” and most of the time we don’t actually appreciate it until we are exposed to it. Most of us shout only when things go wrong but rarely do we appreciate and praise when things are running smoothly. Some of you might not be aware as to how up-to-date everything (live scoring and statistics wise) is; from the Australian Open website, Channel 7 broadcast, and even the free applications available for free on your mobile gadgets. On Monday the 25th of Jan 2010, IBM took our Insights 10 group for a tour and also a demonstration on how they keep things together. We were then taken to see the IBM servers being hold up onto a mobile rack, hidden away from the public (where the geeks normally are, a hidden storage room under, with bunch of LCDs, servers, and computers :D). This is where things get monitored to make sure that everything runs smoothly. We were tempted to pull a plug on the server to see the guys running around in panic, but of course we didn’t. The server actually goes mobile from time to time and if I remember correctly, the data is kept synchronized with the other 3 servers around the globe (one in the U.S). It amazes me how the bandwidth can hold up these much information going around the world at the same time (television broadcasts, live updates on websites and also the mobile applications). On the IBM tent where we had a lovely 3-course lunch meal, we were exposed to a few applications that the IBM techies use and we could also see the servers load and energy usage on the LCD display. There seemed to be a lot of requests happening to the server from Applications (I’d have thought that most requests would come from the Australian Open website). Unfortunately I couldn’t take pictures of the graphs so I couldn’t show it to you guys here. CHUMP is the primary application in which scoring data is inputted on-site and is essentially an electronic scorecard, calculating basic statistics (Serve %, Double Faults, Aces, Break Points, Challenge data etc). CHUMP software is loaded onto a handheld unit, which is connected to on-court electronic scoreboards & also to the Scoring System for on-site distribution. 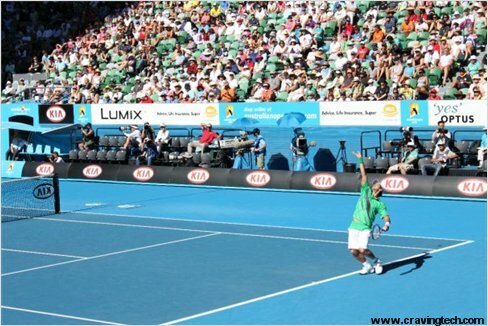 Every match on every court in Melbourne Park, Qualifying, Main Draw, and other events on the Official Schedule, uses CHUMP to score the match during the event. 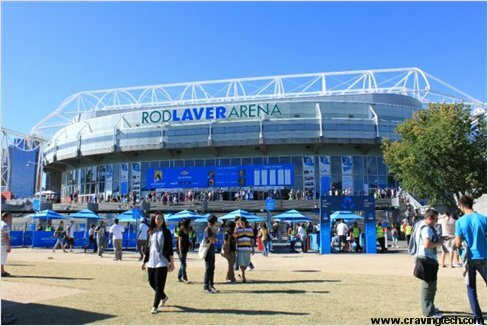 These scoring and match statistics are accessed throughout the whole network with a data “push” model to many places – the Australian Open website, the scoreboards (inside/outside of the court), mobile applications, commentators’ screen, and many more. 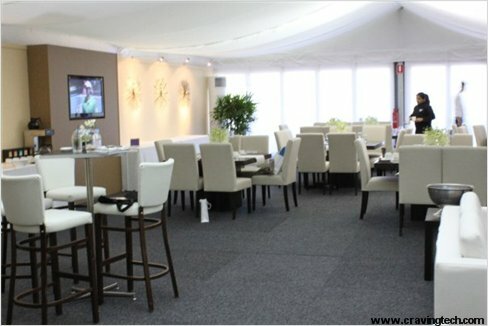 With so many information going around at the same time (remember that there isn’t only 1 tennis match playing at one time, but many), it really amazed me that things kept running smoothly and there were no miscommunications internally (well there might be, but it’s well hidden if it’s even happening :)). 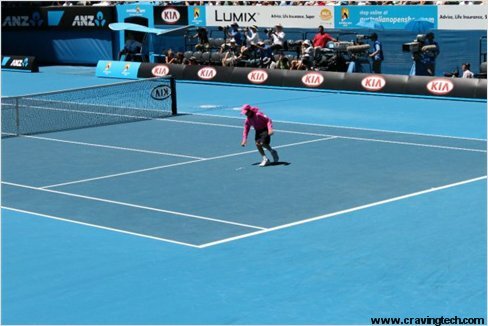 So yeah, there are speed cameras/sensors on the courts to calculate the speed of the serve and there are also cameras for the challenge replay system. I’d really love to know how the challenge replay system works but unfortunately the IBM only provides the data but the technology is done by another company. Law of physics and trajectory calculations were done but I couldn’t get any more information about this. Unfortunately I wasn’t allowed to bring in my 55-250mm lens to the court so I couldn’t make some good shots out of the players. But thanks to IBM, we all got very good seats: 3rd row from the front! I never watch tennis matches live (normally on TV) so it was a thrilling experience to me, especially when they hit the ball hard. 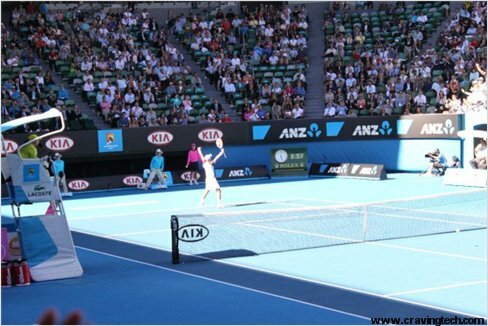 If you want to know more about IBM technology powering the Australian Open, head off to IBM – Do you see what we see? page.